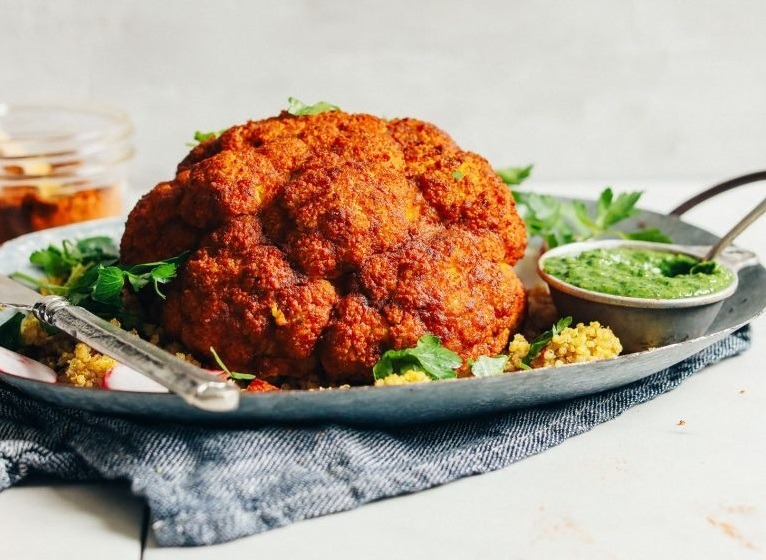 Just 5 ingredients and 5 tips to the perfect roasted cauliflower! Tip #1: Start with a sauce comprised of spices, a little oil, maple syrup, and salt. The result is a flavor-packed marinade of sorts that’s perfect for lathering all over your cauliflower. Tip #2: Flip your cauliflower upside down to let the sauce pour down the core, shake it around so it infuses the center, and then flip the cauliflower over and use a brush to rub the leftover sauce all over the exterior. Tip #3: Add just a pinch more spice and salt to the exterior for even more flavor. Tip #4: Place a pan with water on the bottom of your oven while baking so the cauliflower steams and gets softer faster. Tip #5: Turn the oven to broil (heat from above) at the last minute to get a browned outer edge.